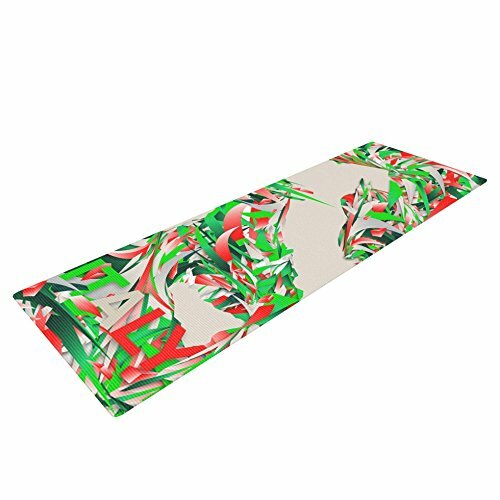 Release your inner yogi in style with these artistically unique yoga exercise mats. These mats allow you to stretch and pose freely and comfortably as they are 72" x 24". Made of a durable, textured non-slip backing foam, these 1/4" thick mats will cushion your body to allow you to child's pose and more during your workout routine. Carry your lightweight mat in a polyester blend bag with an adjustable shoulder strap for easy travel and clean up. These yoga exercise mats can be cleaned with a swipe of a towel and mild soap. At KESS InHouse, we see home decor as a chance to add art to the home and to bring together a collaborative community of artists. Whether it's on the couch, in the kitchen or hanging from a wall, we believe that art enriches our lives and we want to support the artists who make it possible. For this reason, a percentage of every KESS InHouse sale goes back to the artist who created the design. KESS InHouse curates every piece of artwork specifically keeping in mind the product line. We pride ourselves on the quality and integrity of our company and home decor line. KESS InHouse believes artists should be rewarded for their creativity, imagination, and ability to transform a blank surface into something remarkable. We would like to invite you to join us in our fight against blank walls and creatively lacking homes. If you have any questions about this product by Kess InHouse, contact us by completing and submitting the form below. If you are looking for a specif part number, please include it with your message.